I HATE to see Useful Items wasted! There are many things a person could do with Old Bicycles that will keep that metal out of the Trash Pile. You just have to be Creative. There are many sizes and types of Bicycles so some of the uses I have listed here will not work for all Used Bicycles....but most will. Of course for most of these uses you will need a welder. 1. Number One and My Favorite! 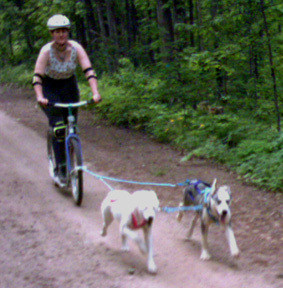 Years ago when I was training and racing Sled Dogs I heard about a new sport (this was in like 1987) where people where Training and Racing Sled Dogs on Adult Sized Scooters! Where do you buy such a thing?! I went to the Local Bicycle Shop and asked. They gave me a brochure on Adult Sized Scooters in Germany....MAN WERE THEY PRICEY! So I really looked at the photos and came up with an idea. I went to a Garage Sale and bought a used Mountain Bike for $1 or $2. I took it home and we took the wheels off, cut it apart, took off all the brakes and shift gears. I took it and the brochure of the Scooters to a Welder and told him what I wanted. He laughed and gave me a great price, he was interested in creating this idea, and before I knew it the wheels and brakes were back on the frame and we were cutting and sanding a Kick Board. Man. I have a lot of miles on that Scooter...with and without dogs pulling it. For more information on having your dogs pull you on a Scooter, go to our websites www.DogStarKennel.com and or www.WorkingGermanShepherdDogs.com I have on those sites, How To Teach Your Dog To Pull as well as Harness Information. And having your dogs, yes of any breed, pull you is a BLASSSST! 2. Fix the Bike and keep using it. 3. If you have outgrown the Bike, fix it up, grease it up, and give it to a smaller someone as a gift. It might surprise you how many kids and or adults do not own a bike and would LOVE to have one! 4. If you do not own a Bike and would like to, go to Garage Sales and Pawn Stores as well as Thrift Stores. You can buy one for "a song". Some might need a little work, others will be ready to ride with air put into the tires. Not only is it fun to ride bikes, it is great excersize and a good way to save money not buying gasoline. 5. How Red Neck are you? Used bikes could make a great fence line. Just wire the wheels together and stagger them so that they stand up without falling over. 6. Add a Trailer to your old bike and use it for hauling around the Farm, or items home from shopping. 7. Take the Bike apart and haul the metal down to the Recycling (recycling, get it?!) you might be surprised at the money you are paid for it. 8. Take a useable Bike down to the Pawn Store or sell it at a Garage Sale. 9. 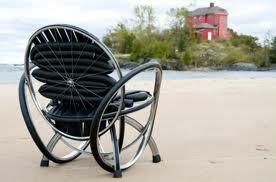 Use the Seats from several Bikes to make Funky Seats for your Outdoor Furniture. 10. Take the Chain off the Bike and clean it up very well. Make Jewelry for yourself, for gifts and or for sale. 11. Make Clocks with the Gears from a Bicycle. Sell them on the Internet. 12. Using few different size and shaped Bikes take them apart and weld something weird to ride together with the parts. Just make sure that your new "bike" is not only functional but built stable for the safety of the rider. 13. Refashion a Bike into a circle (rounding the front end to the back end) and use to wrap around a large Flower Pot. 14. Build a couch with a Bike Frame on either end. 15. Fit up your old Bike but take the front tire off and add a Shopping Cart (don't steal the Shopping Cart) Ride it around town. All of your purchases inside the Shopping Cart and "cause a stir" all over town. 16. Make a Moving Table for Outdoor Party using two old, but matching sized, Bicycles on either side as the Table Frame. 17. What is it you don't like about your "old bike"? The color? That is does not have a rack for panniers on the back? Take your old Bike a part and Remake it. Change the color, grease and clean up all the parts. 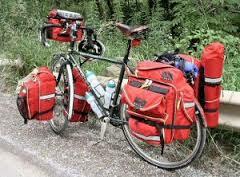 Add a Back Rack and buy a new set of Panniers. Not only will this be fun for some people, it makes the bike just as YOU want it, and it will be something you are proud of. 18. This idea above, number 17, is also a fun way to spend time with your young teen ager or younger child. Buy an inexpensive bike from a Garage Sale, saving it From the Trash Pile. Spend the time with your child to make the Bike theirs. You will not only have fun doing this, you are making life time memories. 19. 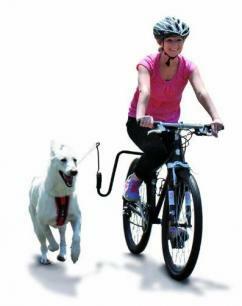 Use parts from an older Bike to make a Cart for your dog to pull. 20. Warning: If you take the wheels off a Bicycle to use for Cart Wheels, check to see what the weight limits is on each Wheel. Many larger adults have been injures with broken wheels spooking ponies while riding in a cart behind the animals. 21. Old Tires and Tubes can be used to make Belts....odd and fun belts for peoples waists. 22. Set the rear end of your Bicycle up on a stand and use the Bicycle now for a Stationary Bike for excersize in front of your TV. 23. 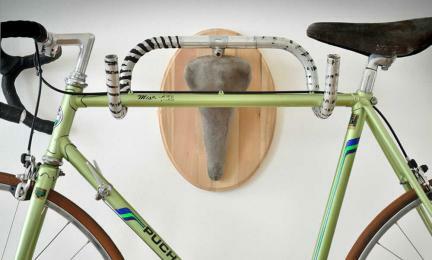 Use the Handle Bars and Seat to make a Rack to Hang your new Bike from in your home or garage. 24. Use a Bicycle Wheel (less the tires) to make a fun Chandelier. 25. Take a Basket Making Class and create a Basket just for your Bike. Give an old Bike a new look. A New Look you will be especially proud of and want the world to see. 26. Take a Bicycle apart, small bikes are good for this, refashion it into a Trailer for your Bicycle. If this is made for a child or pet, make sure there is some short of wind (rock and mud) shield. 27. Use a small Bike Tire for a Picture Frame. 28. There are good people in all areas of the USA that take in old Bikes and fix them up to give to children for FREE! If you have an old bike or bikes in your Garage, you might want to look up this person on the Internet or ask at a Local Bike Shop, where this person in your area, and take them your old Bikes. 29. If you are out of work...gather up Bikes that people no longer want, and fix them up and sell them in the local News Paper on on line. 30. There might be someone near you, near a Bike Trail, that rents Bikes. They might pay you for yours...or at least your old bike will have a good home. 31. Ask around to your friends and family. Many times Bikes out in the Garage just need to be cleaned up, oiled, and put air in the tires, to be ready to ride. Gather up a few and sell them at "Bike Sale" on a nice Saturday Morning in your own Driveway. 32. Again, if you have an old Bike in your Garage, pull it out, clean it up, oil it, fill the tires with air and give it as a gift. If this is for someone under 18, you may want to ask their parents first. Nothing worse then being misunderstood. 33. I have seen BIG Balls made up of the rubber from Bicycle Inter Tubes joined up together. 34. Make a new Bike Rack for outside in your front yard. Add old Bikes and Call it Art! 35. You could gather up Bike Wheels of different sizes and hook them together to make a fence or barrier. Make a Driveway with them. 36. Use the Bike Parts to fashion a Coffee Table. 37. Buy the hooks that hang Bikes from Rafters and hang the Bike up out of the way, you might want to ride it again one day. 38. Use the Handlebars and make a Cane for the person that used to ride and love that Bike....it might get them off the couch and out and about on a Bicycle again! 39. 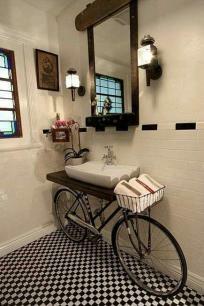 Use the Handlebars, perhaps from several Bikes, in your bathroom for older people to grab and use to move around. 40. Hang several older Bikes on the outside of a Storage Shed in your yard for Decor. 41. Take two older bikes and take the front wheel off one and perhaps the back wheel off the other and fashion a Bicycle Built for Two. 42. Use several wheel to wheel at the edge of your sidewalk to mark it. Leave the reflectors on to light the path. 44. Buy a Child's Trailer, load up the kids and get out to enjoy the fresh air and time together. 45. Learn about "Bicycle Camping" and plan a Trip. Get your friends involved and have a great time. 46. 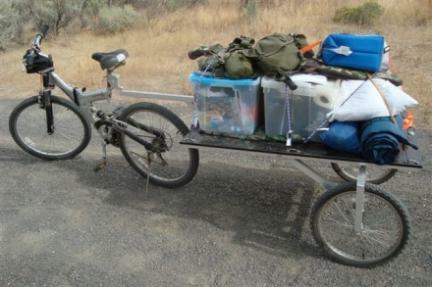 Make a Camping Trailer for Bike Camping to meet all of your own needs. 47. Fix up your old Bike, add a Funny Horn and Lights, Make a Hot Dog Shack Trailer, go and get your Food License and sell Hot Dogs at Parades and such. 48. Feel like a Hamburger with Fries? Ride your bike down to the Restaurant to use up some of the calories that you will consume. 49. While working on all of your other "Preps", take your old Bicycle and make it into a Bug Out Vehicle. You can either buy or make your Panniers and other Bike Bags that can be loaded and ready to go, right there in your Garage or Living Room. I have information on how to make patterns and sew Bicycle Panniers with photos, on the 101 Ideas for Bicycle Panniers here on this site. 50. Make another, as you did in Idea Number 49, and sell it On Line. 51. Take YOUR old Bike out and teach your child to ride it. 52. Fix it up and Decorate it for the next Parade in your area, yes, ride it in the Parade. 53. Or, Fix it up so your Child can Ride in the Next Parade in your Area. Work on the Bike and Decorate it together. 54. Grab that old Bike, pump up the Tires. Grab an old Deck of Cards and some Clothes Pins. Yeah, you know what I am going to say....Make that motor sound and embarrass your kids a little as you ride your cycle up and down the road in front of your house. 55. Use your old bike, or maybe two old bikes to make a frame and cart for your Bar-B-Que Grill. This will give you an easy and fun way to move it around your yard or move it from storage and back. 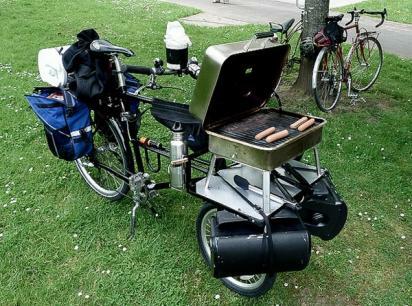 If you are really clever, make it so that you can ride the Bar-B-Que Grill. 56. Have you seen those old time Push Blade Lawn Mowers? I have seen them welded into the area of the Front Wheel of Bikes...just be careful, those turning blades can be quite dangerous. 57. Go out into your Garage and get out your Old Bike and your Spouses Old Bike. Clean them up and air up the tires. Decorate her's with Flowers. Pack a Picnic Lunch into the Basket of His. After it is all ready to go, go and get your Spouse and Surprise them with a Fun Inexpensive, Good For Your "Date". Plan another of the same as you enjoy your meal out on the trail or local Park...with or without the kids. 58. Buy a Book on your local Rails To Trails Bike Trails near you. Set a date and invite your friends and their children to meet you for a ride. Give people enough time to either clean up and ready THEIR old Bikes, or buy new ones. 59. Old Bikes and Duct Tape.... Ha3 Why Not!? You could give your old Bike a new look. Duct Tape comes in many colors and prints. Choose a couple and have fun with it. Remove or hold your Bike Wires away from the frame as you wrap it. Add this to all the things a person can do with Duct Tape. 60. Ask your child (when they are old enough) to fix up your bike for you. Then, without working it over after they have worked on it, ask them to go for a ride with you. Long or short trip, all of this will give your child a memory for many years to come....after all, you trusted them to fix up your ride. 61. When your children reach the age of going out alone around the neighborhood on their own bikes. Use that old Bike of yours for the opportunity to go out with them the first couple of times to show the all the safe ways to ride a bike. 62. Do you have Chickens or other birds? There is something about a Bicycle that makes birds want to sit on them. Give your Chickens a fun place to take a break. 63. Use an old bike or two for gates on your fencing. 64. Put the Bike or Bikes up on top of your vehicles and drive around town. I small towns, this will get some talk....they might think you are out riding the things! 65. Before your next party clean up your Old Bike and bring it in the house. Place it in a bedroom or other area and wait to see who will ask about why it it there. 66. Old Bikes can be worth some good money. Many Bars and or Restaurants might want to buy them from you for Decor. 67. Before going out to buy and New Bike. Take a Ride Around on your Old Bike. Know what it is you are looking for to improve your ride and fun on the trial. 68. Some Bike Shops, not many any more, but some, might give your a Trade In on your old Bike. 69. Give your old Bike to a Thrift Store. Someone will come along and buy it and give it a good home. 70. Take the Bike apart and make a Gardening Cart. 71. Use the Bike to get around your large pasture to check on animals...well, Mountain Bike that is. 72. Gather up some Adult Sized Used Bicycles. Find a Local Scout Troop and either ask to help the kids fix them up or find a Scout Leader that might want to help the kids fix up the bikes and take the kids for a nice ride on the Bikes that they each fixed up. 73. Looking for a Project to spend time with your own kids and to get to know their friends? Do the same with your own kids as Number 72. 74. Offer the Bike to someone your know that does not have a Drivers License or lost their for drinking. 75. Tire Tubes are used for all sorts of ART, take the Tubes out and give it a try. 76. Freak Out a Friend that lives near you and Ride Your Bike To Go And Visit them. 77. Buy a Trailer for your Bike and take bets that you can use your Bike rather than Drive for One Week ~ Weather Permitting. Not only will your save Gasoline Money, and get great Excersize, your could make a lot of money, if your friends bet high and you hang in there and ride that bike. 78. Start a Trend with your Friends. Start inviting them to ride bikes with you. Have a Plan of Route and maybe stop for a bite to eat along the way. 79. Did your Dr tell you to excersize or die? Start by walking, work up to your bike. Just like a kid, you will love the feel of the Wind In Your Hair. 80. Do you have a Teen Age Son that believes he knows everything? Take your Old Bikes apart and have your son put it all back together.....bet he asks you for help. 81. Arguing with your Spouse? Grab that old Bike and go for a ride! 82. Did you read Number 1? I want to make another so that my Husband and I can both go out with a couple of dogs ~ Real Fun! 83. Take a wheel off a bike, hand it from a chain over a Fire. After it has cleaned off, add hot dogs and other foods you want to grill. 84. Dress Up as a Cyclist for Halloween. Push the bike along to make it look real. Use a Pannier or Handle Bar Bag for your Candy Loot. 85. Set up a Bike Rack for your kids friends out in your yard. Set your Old Bike in it so that the kids get the idea of what a Bike Rack is. 86. Have some fun with an old Bike and a Round Bale of Hay, this is especially fun if you live along the Highway.... Take the Front Wheel off your bike. Cut an area of your Hay Bale just above Center. Shove the bike into the area you have cut out as if someone has ridden their bike into the Bale. Add Shoes or Boots on either side of the Bike Frame to make it look like a persons feet. 87. Add LED Lights all over you Old Bike, take a night ride and draw a bunch of attention. 88. Paint your Old Bike Frame White. Take Permanent Markers and have some fun. Have you always wanted a Tattoo, but do not want to have it on Your Skin Forever? Put the Art on your Bike Frame. Enjoy it there. 89. If you do not want to Paint or Wrap your Old Bike with Duct Tape, Have a little fun with Vet Wrap. Vet Wrap comes in many colors. When you want to remove it later, it is not hard to do. 90. Paint your Old Bike and put a Basket on each end, that is on the Handle Bars and behind the Seat. Add a Flower Pot in each Basket and display in your Front Yard. 91. Ladies. Paint your old bike All One Bright Color. Add a Large Fancy Purse over the Handle Bars to carry items. Ride it and start a new trend in your area. 92. Place an Old Bike into the Fork of a Younger Tree. Leave it there. In years to come the bike will become part of the tree. 93. Take a Wheel off your Old Bike. Take the Tires off that Wheel. Clean up the Wheel and Paint it. Hang it on your wall and clip either Playing Cards, the way we did as kids to make a motor; OR, weave art or photos into the spokes. 94. Hang an Old Bike Wheel, straight down or flat to the ceiling, down about 4" or so, from the ceiling. With hooks, hang pots and pans from it in the Kitchen, or plants and flowers from it in your Office. 95. Remember Handle Bar Streamers??? Make your Bike Silly and Fun with some sort of Streamers Hanging From Your Handle Bars that best show your personality. 96. Do your Crochet or Sew or Knit or Weave? Do something fun on your bike. Make something for the open areas of your Bike Frame (make sure it is safe when riding). 97. I have seen photos of people's bikes where they have built little "Mini Bars" in the inside of their Bike Frames. 98. Did you ever see the folks Bikes that have added Zip Ties around the Bike Tires to make the bike tires "Snow Tires"? Get out and ride that old bike in the snow. 99. Paint Your Bike all one color. Maybe even the same color as your Privacy Fence. Set it up in your yard, all one color, as Decor. 100. If push comes to shove and you must take your Bike to The City Dump. If it really only needs a little work, tell the people working at the Dump that the Bike is in Good Repair, you just need to get rid of it. That person might have an outlet for the Bike or even let your set it aside so that others might pick it up and take it home to use. 101. Fix it Safe and get on and Ride. Feel Young and Carefree again! Whatever your do with your old bike make sure it is safe. Keep safety in mind above all.